All the latest cleaning trends involve the term “microfiber”. Microfiber cloths and microfiber towels are becoming increasingly more popular as they assist in making the cleaning process quick, effortless and less of a nightmare all round. When you use a microfiber cloth there is no need to use any harsh chemicals or cleaning liquids. In conventional cleaning methods, you often find that these products are necessary to remove stubborn dirt and grime yet you still need to put in quite a considerable amount of elbow grease to get the job done. Microfiber cloths and microfiber towels are more effective despite the fact that you don’t even need a single drop of detergent. Microfiber cleaning aids are truly magical. At Microfiber Tech you can purchase a whole array of fantastic products to make your household cleaning a breeze. We Take Care of Our Customers, and Our Customers Take Care of Us! HOW DOES MICROFIBER TECHNOLOGY WORK? You might find it strange that using a microfiber towel or cloth requires no cleaning fluids to remove stubborn dirt and grime. In fact, you probably think that it is completely impossible. This fantastic man-made fiber is approximately the same size as a human hair. In order to make a microfiber cloth is made when bundles of these minute fibers are spun into yard or thread which is then used to make a knitted sheet. The tiny microfiber bundles are split into even smaller single fibers which are about 1% of the size of a human hair. To ensure that the microfiber towel or cloth doesn’t crumble to pieces, a combination of carefully selected chemicals, heat and agitation is used in the fiber splitting procedure. So despite the fact that microfiber seems more delicate than other materials, it is in fact more resilient. The source of a microfiber cloth’s cleaning power lies within the tiny fibers. The more splits there are in the microfiber bundle, the better the product’s performance will be. When microfiber towels or cloths have a higher number of ‘bundle splits’, it will be much easier to clean surfaces with nooks and cracks. The increased number of splits also increases the absorbency of the product and allows it to easily trap dust particles, grime and dirt. 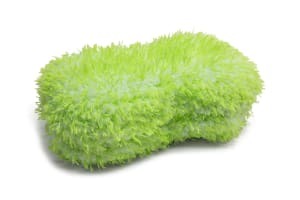 Microfiber Tech is your one-stop store for a whole range of fantastic microfiber products online. This store has the largest selection of microfiber cloths, towels, mops and other cleaning products that can be used in and around the home. This is the one place where you can order all your cleaning supplies 24 hours a day, 365 days a year, one item at a time or microfiber in wholesale. Microfiber Tech aims to make your online shopping experience as simple and secure as possible.